We act as the in house IT support company we create a site operating procedure manual and work to that. Managing the Apple Mac and Windows hardware requirements of businesses and public sector clients since 1992. The business alternative to Dropbox you can brand as your own. Store and access data online and share with clients. From simple web hosting and email to dedicated servers. We guarantee 99.9% uptime and 24/7 support. 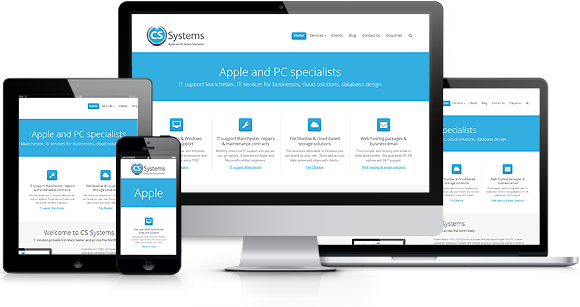 Established in 1992, CS Systems is a team of highly reputed Apple and PC system specialists delivering IT support and network integration services as well as a range of cloud-based solutions for businesses of all sizes. As a leading force in Manchester’s IT support industry for over 20 years, CS Systems offers comprehensive IT solutions to all kinds of businesses, from healthcare providers to marketing agencies. Our expert engineers are based in Old Trafford and are able to travel across the whole of Manchester and the North West to meet our clients’ repair, maintenance and support requirements. You’ll find our team to be knowledgeable, experienced and highly approachable and we pride ourselves on our professionalism and commitment to our clients’ projects. View our client testimonials to discover more about what you can expect from CS Systems. CS Systems designs and installs tailored IT systems for local companies in the North West. Using the very latest software and devices, we create systems that are efficient, reliable and fully scalable, ensuring you and your staff are able to work as productively and securely as possible with the latest technology. We specialise in network and database design and installation and all of our custom systems are designed to offer the scope for expansion, ensuring that your IT infrastructure is in a position to evolve as your company grows. We also offer on-going support and maintenance packages, offsite back-up options and web hosting services. Please visit our Services page for more information. We understand the challenges facing modern businesses and we know from experience that our clients appreciate an IT support service that’s fast, flexible and forward-thinking. Our consultancy-based approach ensures that you’ll recognise the value of our devices and systems and will fully understand how your investment is going to benefit your staff and your customers, both now and in the future. Our consultants and engineers are also entirely unbiased when it comes to the latest technology, so you’ll only ever receive recommendations based on your needs and your budget. Call us today to learn why we’re one of the most respected and successful IT companies in Manchester. You can reach us on 0161 872 0921. "Studio Liddell have used CS Systems for the supply and ongoing support of our Server & Workstation hardware for close to 8 years. During this time we've found all staff to be extremely professional, reliable and extremely knowledgeable in their field of expertise"
"We've used CS Systems as our technical support since we started in business over 10 years ago. From engineering call outs to assisting us with system upgrades and site moves, Adrian and his team have always dealt with us in a knowledgeable, approachable, friendly and professional manner. The only other business partner we have used for that length of time is our accountant - which speaks volumes!" The New Apple MacBook Pro.